Well it is time to install the servers and as promised earlier detail how to transfer our data from the old SBS 4.5 System to the new SBS 2000 System. As mentioned in the first article of the series, don't try to do an "In Place" upgrade of the SBS 4.x Server. I have yet to see it work completely. That is why we are having to transfer the data. Installing the Servers is really pretty straight forward. The folks at Microsoft really listened on this one. You can now pick and choose which Servers you want to install, unlike previous versions where you had no choice but to install everything. Of course you have your plan (remember you wrote it out when we started) so you know which ones you're going to install. Most people I've talked to start off with Exchange, ISA and the Fax Server. You can always go back and add or remove them with SBS 2000 so your not locked into this decision. After you have rebooted from the first part of the installation (where we left off in part 2) you are presented with the option to continue the install. Choose not to at this time, you'll get another chance every time you reboot until you finish. Take this opportunity to checkout the newly installed server. Make sure everything is working correctly and you have no errors in the logs. We need a solid foundation to build on. When your sure everything is good reboot and choose to start the install. 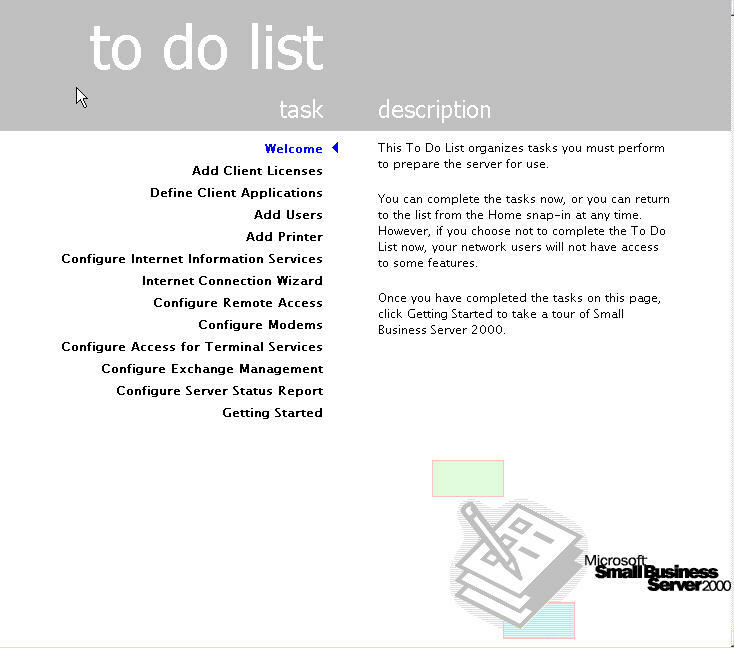 DC-promo will run and convert the server to a Domain Controller installing Active Directory in the process. You have nothing to do at this point but maybe have a coke. The installation program will reboot and present you the list of choices I discussed above. From here on it is pretty much automated and you can relax again until the install finishes. When it does you will be presented with a to do list. Of course you add users with the Add User link on the to do list which you can always find in the Administrators Console. You should create all the user accounts before moving the data so the structure is already in place. That isn't the main reason for this section however. If cacls comes to a file that it can't change the rights to it stops; showing you the file and the path so you can take ownership of it. Then you just re-run the command again until it completes successfully. 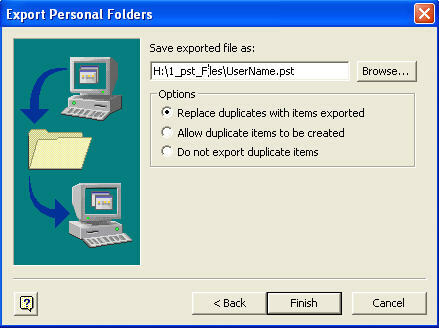 Don't worry about messing up the permissions of these files and folders. We are going to get rid of all those conflicts in the next section. Just one more thing related to user accounts we need to take care of before moving on. You need to change the passwords on all the user accounts to something simple you will remember like sbs+upgrade. You will need to be able to log on as each user and you probably don't know all the passwords and even if you do this will simplify you life for the next few hours. There is more than 1 type of data and more than 1 location the data is stored in that we need to be concerned with. Of course everybody's layout is different, but there are some generalizations we can apply. You have a Users Folder somewhere with sub-folders for each user. You also have private exchange data, public exchange data and maybe an internal or external website hosted on the SBS box. You may have some SQL data also, although I have yet to meet anyone using SBS who does. If you are one of the few please see the Microsoft KB article Q314546 as I won't be going into it here. So now you can copy all the users data to the temporary partition we just created by dragging and dropping the entire users folder tree in explorer. If you have public and private user folders, make sure you copy them both. 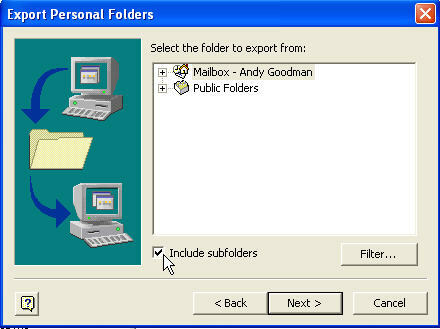 Don't forget the Company folder and any custom folders you may have created on the system. While you are at it, create a folder off the root of the new partition called 1_pst_files this will be used later. By using this name trick the file will show up at the top of an alphabetical list. Next, if you have a public or private website hosted on the old SBS box fire up FrontPage, open the site and re-publish it (or them) to the temporary system. Lastly, but the one that will cause you the most grief with users if something goes wrong, is the Exchange Data. There is a utility for exporting the mailboxes available on the Microsoft site, but I have had unofficial warnings not to trust it. So we'll do it the old fashioned way. You may have never had to do this so I will try to detail it for you with a number of screen shots. You are going to need to log on to our temporary workstation as each user 1 by 1 and perform the following procedure. Aren't you glad we changed all those passwords to the same one earlier! 9. 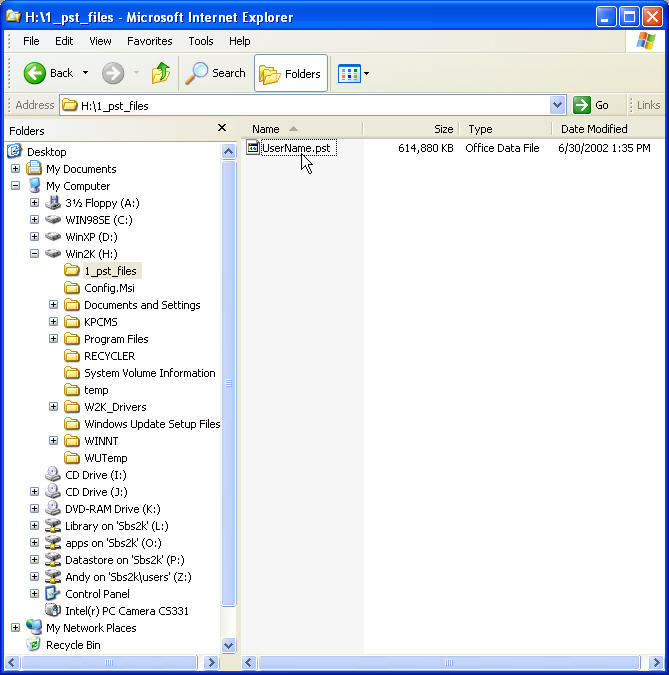 In the "Save exported file as:" field set it to our handy folder on the temporary drive and name the file with the users name you are currently logged in as, and don't forget the .pst file extension. 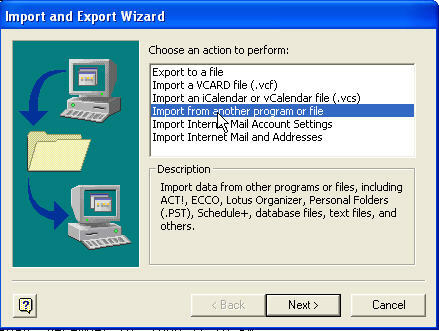 Take the default of Replace duplicates with items exported. That way if you have to rerun for any reason you will have the most current data with no duplicates. 11. I like to change it to the Users Name so I don't get lost during the process. 12. 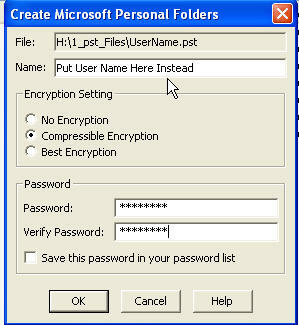 Give the file your handy temporary password (the one you used for all the user accounts) This will keep your users Exchange Data private if someone else gets on the temporary system. Do not check the save password box. 13. 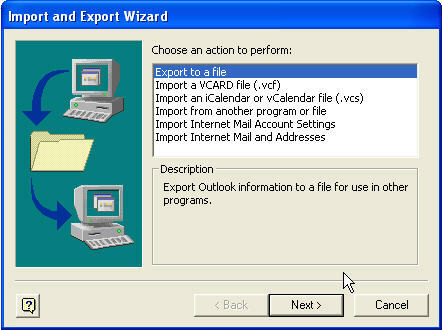 Now depending on how much the user has stored in Exchange the wizard will export the data. 14. 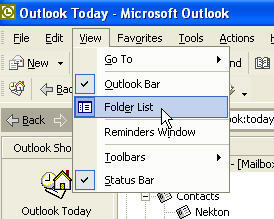 You will see a number of these windows go by, one for each folder or sub-folder. Some go by so quick you don't see them. 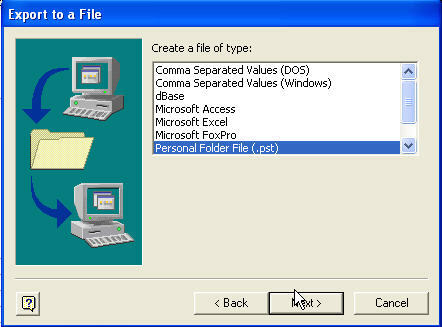 Now if you have Public Folders with data in them you will need to log on as the owner of each folder and repeat this process changing step 7 to the public folder you want to save. If you have more than 1 do them individually by the owner. Later when you have the rest of the server configured (the to do list) you can fire up FrontPage again and re-publish your websites to the new SBS 2000 Server. This would also be a good time to copy back all the user's private and public data. Make sure you copy the data and not move it. 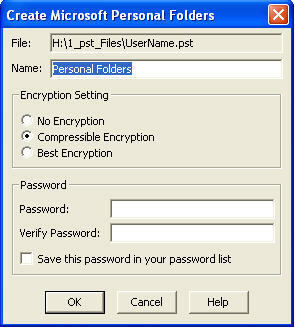 If you copy the data it will inherit the permissions of the user's folder you copy it into. If you move the data it retains the permissions it currently has which are everyone by default, as it is coming from a Fat32 partition. Next time I will have some tips and gotcha's to watch out for when you configure your server.